Representatives of the Niagara Falls Boys & Girls Club, the winning nonprofit organization of the 2018 21st Century Fund grant, pose for photographs with the presentation check alongside Clotilde Perez- Bode Dedecker, President/CEO, Community Foundation for Greater Buffalo, and Ted Borowiak and Carolyn Human, Co-Chairs of the 21st Century Fund. 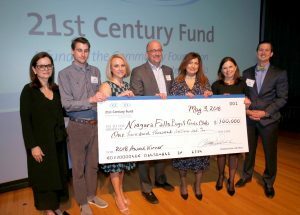 The 21st Century Fund is a giving circle that is open to anyone who wants to give back to Western New York. All it takes is a onetime membership fee, and then you’re a member for life. Every two years, members vote to provide a $100,000 grant to one nonprofit organization. Members have the opportunity to network with others who care about Western New York, learn about critical community needs, hear about innovative local projects and meet the dynamic leaders of area nonprofit organizations. Membership in the fund is $2,100 for any individual, family or organization that wishes to take part – $1,000 if you are age 35 or under. Membership pledges can be paid over the course of five years.